Yesterday our company has bought a new router to complete our enterprise network setup. So what’s about the router? This is Linksys RV042 router with Load Balancer, 4-VPN Ports and SPI firewall features that promise to help you maximize the network performance and reliability. 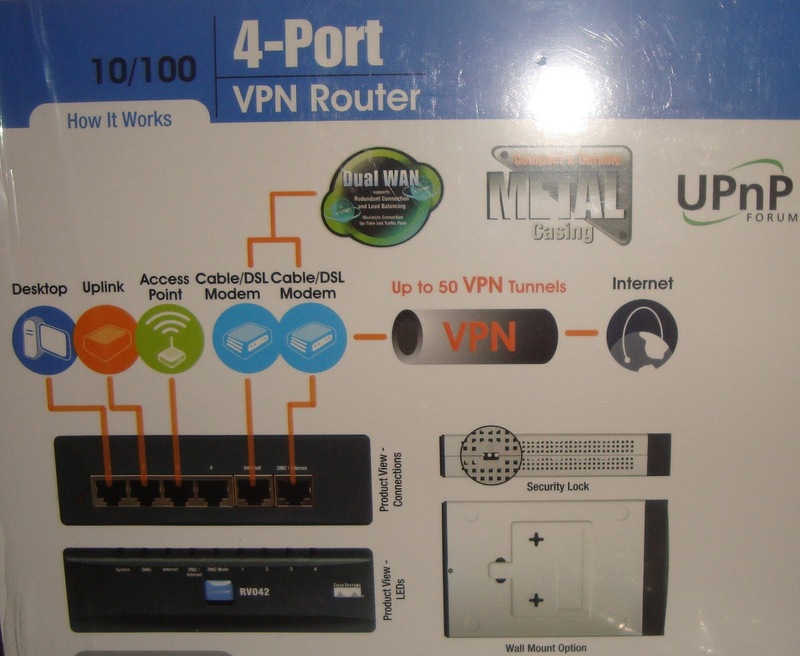 4-VPN Ports-Virtual Private Network(VPN) is the capability to create an encrypted “tunnels” through the internet,allowing up to 50 remote units or user to connect securely in your corporate network regardless of their whereabouts. The user through VPN can access emails,files and the intranet. More so, the 4 ports VPN (Full Duplex-10/100)features also helps you connect more hubs and switches to expand the network. Philippine companies like Rose Pharmacy Inc, LBC, RD Pawnshops, and many other are using a Virtual Private Network(VPN) to securely share corporate information about their daily operations from branches and to another. Only those VPN member is allowed to enter the private network. Load Balancing- “the router’s capability to combine separate internet connection, doubles up the signal, and has an auto backup mechanism; when one internet line is down the another internet line takes control to continue the connection” –this feature grab our company's interest since we need to combine some internet line for an advance purpose. Example: Interline line 1 has a bandwidth of 3.2 mbps and Internet Line 2 has 3 mbps, therefore the total bandwidth of the two lines would take up to 6.2 mbps but this would vary in many reasons. SPI Firewall –protect every PC connected to your VPN against intruders. SPI Firewall can filters a set of IP address only allowed to access the network. The package contains Power Adapter, 10/100 VPN Port router, Networking Cable, User and Quick Install guide. The Linksys RV042 router would cost around PhP 9,000 here in Davao.